The tail may be the length of the bobcat tail, which may come half way to the ground, or it may be lacking entirely, as in the Manx, or it may be any length in between. Desert Lynx officially come in three coat patterns in all eumelanistic colours--ebony, blue, sorrel, fawn, chocolate, and lilac--including silvers, sepias, minks, and snows. The coat patterns are tawny (ticked), leopard (spotted), and clouded leopard. However, it is not uncommon for them to occur in red and cream colours. The leopard pattern is a spotted tabby pattern. It is marked by spots of the darker colour, most prominent on the sides of the body and the belly. The spots may vary in size and shape, but should be evenly distributed. Preference is given to rosette spots which are formed by a part-circle of spots around a distinctly lighter centre. Contrast with ground colour may not be as distinct as in some spotted breeds . A dorsal stripe runs the length of the body to the tip of the tail. The stripe is ideally composed of spots. 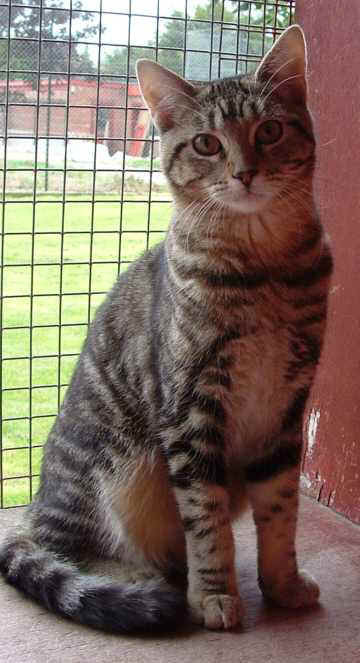 The markings on the face and forehead are typical tabby markings, with the underside of the body having distinct spots. Legs and tail are barred. In the sepia, mink, and snow subdivisions, it is desirable for ghost leopard spots to appear on the bodies. The tawny pattern is a ticked tabby pattern marked by ticking on the body hair with various shades of the marking colour and ground colour, with the outer tipping being the darkest and the undercoat being the ground colour. The body may exhibit a barely perceptible spotted pattern. The tail, legs, and face will have tabby pencil linings. Necklace tracings will are also frequently seen. The clouded leopard pattern, while derived from modifications to the classic tabby gene, is different from the classic tabby pattern, with as little bull's eye similarities possible. The pattern gives the impression of marble, preferably with a horizontal flow. Vertical stripes are undesirable. Contrast should be good, with distinct shapes and sharp edges. The belly must be spotted. Desert Lynx and Highland Lynx are part of the same breed group in the Rare & Exotic Feline Registry. In other words, Desert Lynx and Highland Lynx may be bred together. The curled-eared kittens may be registered as Highland Lynx, and the straight-eared kittens may be registered as Desert Lynx. The breeds are identical except for the ears. The curled ears of the Highland Lynx are caused by a dominant gene which both curls the ears and somewhat reduces the size of the ears. When the two breeds are bred together, the straight-eared kittens resulting from the breeding do not carry any genes for curled ears. Therefore, breeders wishing to work with Desert Lynx only would not have to worry about getting curled-eared recessive genes in Desert Lynx who have Highland Lynx in their ancestry. north into Canada. The bobcat is somewhat larger than domestic cat breeds. It is a powerful animal with long legs and a muscular body and is noted for its short tail. While the Desert Lynx today is a completely domestic cat, it is bred to resemble the bobcat. Through generations of selective breeding with different breeds of domestic cats, the breed has incorporated many characteristics similar to those of the bobcat. 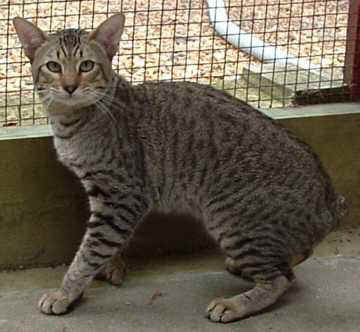 Desert Lynx are medium in length with longer hind legs, and toes may be tufted. They are very alert, intelligent cats. Males are larger than females and slower to mature. These cats come in both long and short hair. The head is large but not round, with a full, well-developed muzzle that is almost square in appearance, with prominent whisker pads. The ears are large and set wide apart, usually with feathering and tufts on the tip. The wide set eyes are large and expressive, set at an angle, with colors ranging from gold to green, with blue eyes in the snows.